There is a relevant editorial in the March 2, 1936 edition of The Presbyterian Guardian. Historically minded readers will recognize this magazine as the voice of conservative leaders who were at that time still members of the Presbyterian Church, USA. However, their remaining time there was but short, for in that year, trials and suspensions were taking place at an alarming rate for no other charge other than refusing to desist from the support of an Independent Board for Presbyterian Foreign Missions. J. Gresham Machen was still alive and writing vigorously for the defense of the Christian faith. Others were taking their stand for the Word of God and the testimony of Jesus Christ. “Why then do we present the facts concerning modernism . . .? Only because it is our duty. We find no happiness in the betrayals of which we must tell. No one in his right mind could gloat over them, or be other than sorrowful. But — if we love the souls of men we must warn them. We must warn a sleeping church, largely uninformed about the nature of its official boards. And finally, if we care anything about the honor of the Lord Jesus Christ, and the place due His Holy Word, we are under a solemn obligation to speak. “This speaking, let it be understood, is in love. But what, exactly, is speaking in love? Is it to speak lovingly? Yes—in part. But there is more to it than that. We speak most in love when the motive that prompts us is love, and when the end desired is the supreme good of the one addressed. The most loving words to a blind man approaching an unsuspected precipice would be ‘Stop! Stop! Stop where you are!’ What would you think of anyone who criticized the speaker of those words because he ‘didn’t have a good spirit,’ did not speak ‘lovingly,’ and who advised the blind man to go on, paying no attention to such an un-Christian fellow? The Presbyterian stalwarts for the faith back in the 1930’s were praying and working for the elimination of unbelief in the Presbyterian church. As we know now from history, such was not to be. And those who were standing for the faith once delivered unto the saints were expelled from the church. WLC 30 — “Does God leave all mankind to perish in the estate of sin and misery? WSC 20 — “Did God leave all mankind to perish in the estate of sin and misery? Mr. John Doak, a ruling elder in the Fifth Reformed Presbyterian Church of Philadelphia, died on 2 March 1974. He was originally an immigrant from Ireland and had been a member of the Fifth Reformed church for over fifty years. Rev. Frank L. Fiol, career missionary to India, died on 2 March 1999. Born in 1912, he attended Wheaton College and then graduated from Westminster Seminary in 1936. 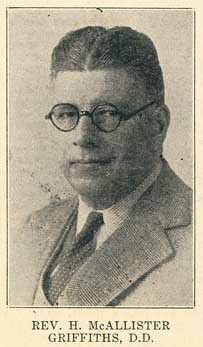 Upon ordination by the Philadelphia Presbytery of the Bible Presbyterian Church, he and his wife sailed for India in October, 1936, under the auspices of the Independent Board for Presbyterian Foreign Missions. From 1936 to 1980, Rev. Fiol served as a missionary, pastor and educator in India. He was honorably retired from that ministry in 1981. Rev. Fiol’s papers are preserved at the PCA Historical Center. Rev. C. Howard Oakley died on this day in 2005. Born in Haddonfield, NJ in 1917, he was educated for the ministry at Faith Theological Seminary and his first pastorate was with the Bible Presbyterian Church in Seattle, WA, 1945-57. Rev. Oakley began a radio ministry in those years and continued that work alongside subsequent pastorates in Cherry Hill, NJ and Memphis, TN. He was honorably retired in 1994. Note : The PCA Historical Center has a small set of materials concerning Hall McAllister Griffiths, but would appreciate hearing from anyone who might have correspondence, unpublished writings, photographs or other materials by Rev. Griffiths. His was an interesting story. Contact the archivist at your convenience. For “the rest of the story” about H. McAllister Griffiths, click here. I’m looking to contact the person who put together these articles. Hall Griffiths was my grandfather. I would love to learn more about the man I never got to know.